This is the second in the Kimberbell petite pillow series following the format of her popular bench pillow patterns. Join Cupcake Quilts as we make a new pillow cover for each month, then switch out the pillow form as the season and holidays change. Two different designs for each month will be made and fit the 8" square pillow form and a new 5 1/2" x 9 1/2" rectangular pillow form. February pillows are an 8" x 8" square pillow featuring a vinyl Jar filled with hearts as well as a quilted pinwheel. 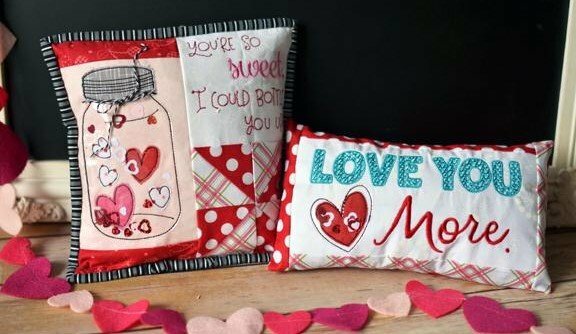 The second is the rectangular pillow with the words "Love You More" embroidered.